I just finished reading the Spring 2013 issue of The Colored Lens. Admittedly, I’m somewhat biased because my story, “Bottle This,” appears in the issue, but my story is only one small reason you should read this issue if you like speculative fiction. At $2.99 on Amazon, this issue is a bargain. Now, off to read the latest F&SF and Asimov’s! The Spring 2013 issue of The Colored Lens is now available! My story referred to in a previous post, “Bottle This,” is in this issue, along with a dozen other stories I can’t wait to read. 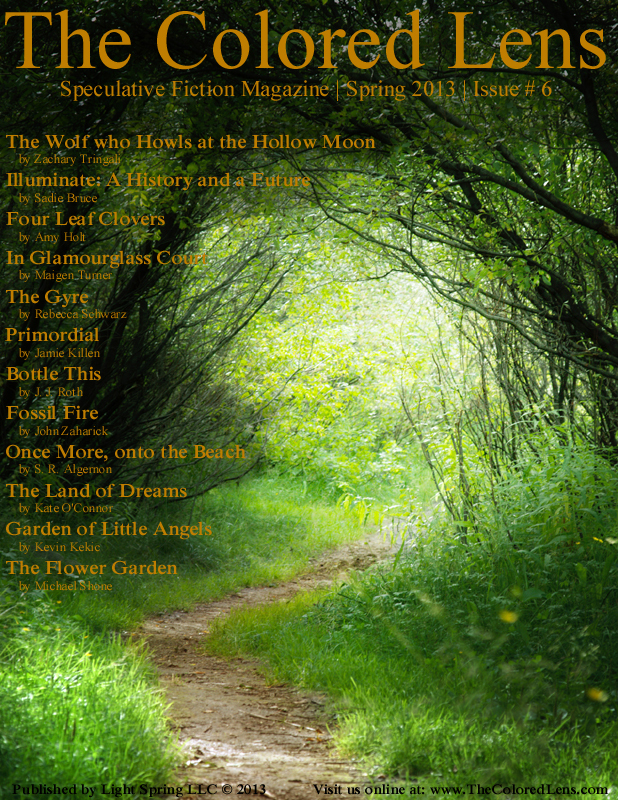 The issue is available for the Kindle at Amazon with a lush, inviting forest path on the cover. Isn’t it pretty? Work at my day job has heated up quite a bit over the past few weeks and my reading and writing have both suffered as a result. I hope that the next time I have writing news to post, I’ll also have some good reading recommendations. “The Nymph of Limantour” is Up! “The Nymph of Limantour,” mentioned previously in this post, is up today at Every Day Fiction as scheduled if you’d like to give it a read. If you miss it today, you’ll still be able to read it, but you may need to search for it. Sale to Every Day Fiction! My fantasy flash piece, “The Nymph of Limantour,” will appear in the online magazine Every Day Fiction this month. It’s currently slated for March 6. I’m delighted, and I’m grateful to the editors of Every Day Fiction for their support of this story. It’s a mysterious thing, but I have more affection for some of my stories than others. I can’t really point to a reason why this should be, either in general or with reference to a particular story. I feel somewhat guilty about it, like I’m not supposed to have favorites among my creative offspring. “Nymph” is one of those stories. Perhaps because it was fun, but difficult, to write. Perhaps because I find the main character, Marin, interesting, and her plight sad but hopeful. Perhaps it’s just one of those mysterious things for which there isn’t really an answer. The story’s setting is a future, somewhat dystopic version of Limantour Beach. Fortunately, the Limantour Beach in our world is still clean and beautiful.